After the amazing outdoor ceremony at the gazebo and a beautifully coordinated reception, the honeymoon couple will be able to relax in style and comfort on their wedding night. Sunny Meade’s honeymoon suite is part of our all-inclusive wedding package on the grounds of the wedding facility. After an unforgettable wedding day, the honeymoon couple can retire to the honeymoon suite where a complimentary bottle of champagne will cap off the perfect day of romance and celebration. All-Inclusive Wedding Ends With Elegance and Romance! 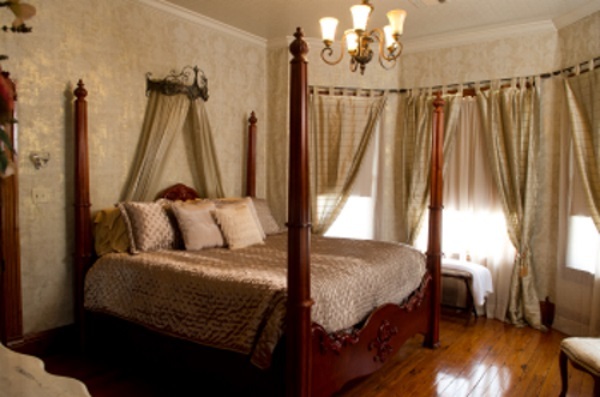 The Antebellum look of the house is replicated in the honeymoon suite and its Victorian style furniture and accents. To complete their romance package, the newlyweds will also have access to the wedding facility’s pool and Jacuzzi. The morning after, Sunny Meade provides a complete Southern Breakfast prepared to perfection. The romantic champagne or mimosa meal will be served in the dining room for the newlyweds to begin their perfect day as a newly married couple!